New Mexico is a unique state located in the Southwestern part of the Unites States with distinct historical influence of Native American, Imperial Spanish and Anglo-Saxon cultures and heritages. New Mexico is also one of the least inhabited states in the country characterized by vast open spaces, arid deserts, forested mountains and several mountain ranges that run through the territory of the state. New Mexico has rightfully earned its status of one of the most artsy states in the US not only because of a large number of art museums and galleries scattered over its territory and not only due to the fact that famous artist Georgia O’Keeffe called it her home but because arts and cultural districts could be seen almost in all major cities in the state. 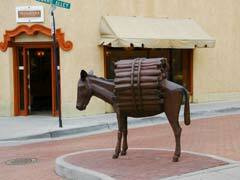 Below we guide you through a maze of cultural and artistic venues in every city of NM. New Mexicans take their art seriously no matter if it’s classical, contemporary or folk types of art, locals are living and breathing art and are totally infectious in the way they proudly display it. Food is another thing that is taken seriously in New Mexico; the local cuisine is a unique melting pot of Native American and Latin flavor perfectly blended to create mouthwatering sauces, tamales, posoles and bean dishes. Chile peppers are star performers that could be sneaked into anything from an appetizer, main dish, dessert and even a drink. Ask locals to guide you through their best restaurants in the area. Taking a New Mexico vacation is like submerging oneself into an art and culinary haven. Winter is the perfect time to leave behind bulky winter wear and set off on a warmer southern New Mexico vacation getaway because lower part of the state is basking in mild weather while the Northern US is experiencing frigid temperatures or head to Taos-Santa-Fe area to enjoy great skiing on the Rocky Mountain slopes. In summer it is just too hot to enjoy southern part of this great state, on the other hand northern part of the state is a great escape with its mountain fresh air, fly-fishing in the rivers and hiking in the woods. Many wonderful and diverse New Mexico attractions await you at the Land of Enchantment. Below we present a brief New Mexico travel guide to help you decide how to plan your next New Mexico vacation. Santa Fe is the capital of the Land of Enchantment State and also its art and cultural center that has gathered state’s most curious museums and galleries like Georgia O’Keefe Museum, Museum of International Folk Art, Museum of Fine Arts and many others. 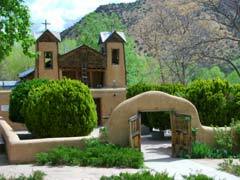 Some of the oldest and most interesting catholic churches could also be found in the city, including Santuario de Guadalupe and San Miguel Mission to name a few. Performing arts are also going strong in the city represented by Santa Fe’s Opera and Maria Benitez Teatro Flamenco where you can see flamboyant Spanish style dancing. 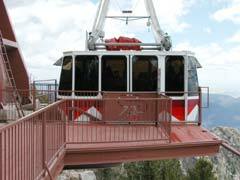 The city has landed on just about any must visit list of attractions according to major New Mexico travel guides. In close proximity to the capital, you will find a small town Los Alamos that is mostly known in America due to its connection with the creation of the first atomic bomb back in the 1940’s. For individuals eager to learn more facts about this event, do not miss visiting the local Bradbury Science Museum that displays objects and memorabilia. Albuquerque is a charming diverse and heavily populated city offering its visitors great encounters from museum going, flamenco dancing and green chile sampling scenes. The city offers it all! Petroglyph National Monument is certainly one of the most popular sights to visit in the city that you can tour at your own pace and take a look at thousands of rock etchings and lots of archeological sites on its grounds. The Biopark that combines the Zoo, Aquarium and the gardens is a true delight for all age of travelers that presents a nice mix of species from flora and fauna. Old Town District is a unique experience that simply must be tried even if you only have a day to spare, visit one of several museums, shop for local souvenirs and pick from authentic restaurants serving up some delectable New Mexico dishes. Taos is one of the remotely located towns in New Mexico that packs an eclectic mix of bohemian artists, Latino families at the perfect backdrop of Sangre de Cristo Mountains. Churches and art galleries are haphazardly placed all over town for guest to explore. Taos Pueblo is one of the UNESCO’s preserved sights that is considered an iconic landmark in the town presenting a very characteristic example of Native American traditional architectural style. Las Cruces is a city located at the southern border with Texas and home to the New Mexico State University. There are some very interesting museums in the city but the most popular attraction is definitely outdoors and the Organ Mountains where you can try hiking and climbing and camping in the New Mexico wilderness. Roswell is one of the wackiest cities in the Land of Enchantment that is widely known for aliens that supposedly crashed on the territory of the city back in 1947. Whether it is true or now you can see for yourself if you visit the local UFO Museum and learn a few facts on the subject. Carlsbad is another tiny town on the southeastern part of the state that draws crowds to its incredible underground natural wonder called Carlsbad Caverns. The Caverns present their visitors with spectacular underground limestone passages that go deep into the ground at the deepest point of 1,500 feet. If you are a fan of geology you will love guided touring of over 100 caverns with various formations growing both up from the ground and down from the ceiling. Our New Mexico travel guide has briefly introduced you to several most popular destinations in the country, however, there’s so much more to discover in the Land of Enchantment.